I didn’t move to Japan with the ambition of starting a business―I came because I fell in love and wanted to follow my heart. I was full of optimism, but without much direction―and that for me was risky and very scary. Before starting my business, I had to get comfortable with uncertainty, get in touch with what I wanted and enjoyed, and then build a business from that vision. It turned out there was a lot of inspiration just on the other side of my comfort zone. That dark, scary, fear-and-panic-filled place was exactly where I needed to be. There was a period after arriving in Japan when I was utterly and completely lost. I had followed my heart. Now what?! It took about six months of working through emotions before I felt comfortable enough with myself and my business plan to meet with a lawyer and incorporate. So how did I get from lost to incorporation? It went something like this: panic / fear / confusion — liberation / inspiration — processing / sculpting — productive action. My reasons for being in Japan weren’t clear. I didn’t have any goals other than being in Japan. And for the first time in my life, I was living without an expectation to attain something. While folks were telling me how “brave” I was, I couldn’t accept it, because all I felt on the inside was scared. What was my professional identity? How was I going to support myself? I left my professional career behind in San Francisco to start over, not at a new company, but in a whole new country and without a job. I unintentionally had given myself a sabbatical and I was not comfortable with that. I was nervous that if I ever tried to go back, the time I spent away would count against me. I was also living off my savings, and that felt both selfish and foolish. That money was meant to go toward things like buying a house, emergencies, paying for kids—legitimate concerns. Looking back, the kids excuse seems particularly irrational. I’m not married or with a serious partner, and I now wonder if I was just grasping at straws trying to find reasons not to take a risk. In order to work through my fears, I journaled. I made lists of my fears and wrote out what I would do if the worst were to occur (I learned this from a Creative Mornings talk). I also made a budget and gave myself a realistic timeline for how long I could live without a job. I gave myself a little structure by signing up for language school. I knew I wanted to learn Japanese and that whatever I ended up doing, speaking the language would help. Language school provided goals and accountability, creating structure under which I could thrive. In my heart I knew I decided to move because I needed a change, and I sensed opportunity here. I just had to trust myself to figure the rest out. Once I accepted my insecurities, it was easy to live with them. They didn’t hold me back. They were still there, but they didn’t have an impact on my day-to-day progress. Since I wasn't spending so much time worrying, I had energy to take advantage of being in Japan, which is an incredible place to be! Once I was okay just being here and saw it as part of the process, the world became my oyster. Inspiration was everywhere and I was insatiable. I traveled. I followed my curiosity to places like Echigo Tsumari, Naoshima, Niseko, Yakushima. I made new friends. I met amazing people through language school and the creative community in Tokyo. I read—no, inhaled—so many books. The most useful book I read during this time was Springboard. It helped me re-examine my personal and professional definitions of success and to think about the lifestyle I wanted to create as I started this venture. It provided very holistic thinking about what role your work plays into your overall lifestyle. I made a workbook of my favorite activities you can download if you want! I did personal exercises and invited friends into my process. One of the highest-impact exercises for me was when I emailed 12 of my closest friends and asked them, “What is one thing I do well with relatively little effort?” I instructed them not to think too much and reply in one or two minutes. I received a range of responses back, but all affirmed strengths that I also saw in myself and knew I wanted to use in whatever company I started. I actually saved the responses in my “for a rainy day” folder; they were that meaningful and really made me feel seen as a person. I interviewed people in industries I was interested in. To gain perspective, I sought out people working in those fields and asked if I could interview them. I am so grateful to everyone who jumped on Skype or a phone call or met me in person for coffee. In general, during this period of time I was having meaningful interactions with Japanese people and foreigners that were reinforcing my desire to live and work in Japan. After a lot of conversations, emotionally impactful experiences, and thought-provoking books, I was ready to distill my inspiration into something tangible. I had generated a list of businesses I could start. I picked one and worked on a business plan. 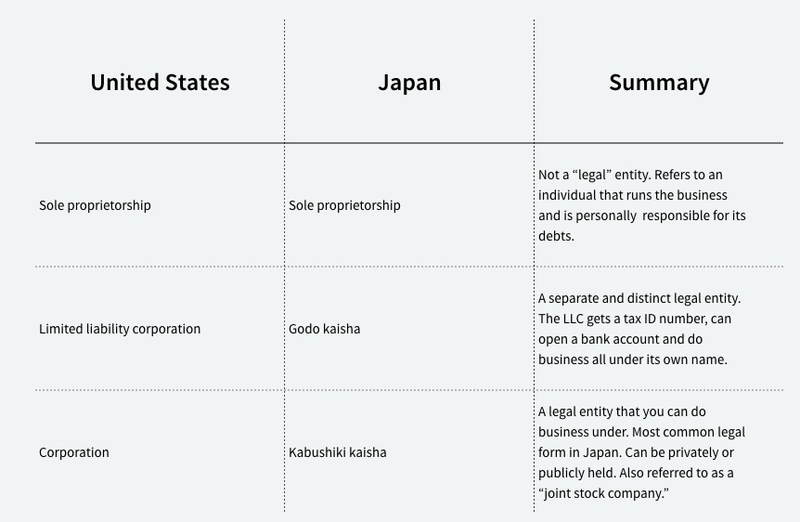 I researched regulations and requirements for starting a business in Japan. And I looked at the competitive landscape—both what companies/services were available and what trends existed. I made a pitch deck for myself, which helped me distill my thoughts. I never intended to approach people for investment, but I appreciated the format for organizing myself. My concept was to recreate an eye-opening trip to Japan I had experienced six months earlier, the trip that inspired me to move to Tokyo. The trip focused on connecting individuals through their interests and exploring areas of Japan that are not known as tourist destinations but have interesting communities living there. Having the idea for the business was one thing, but I needed to make sure there was product/market fit—that there were actually people out there that wanted what I was offering. Luckily, I'd had a steady stream of visitors coming to Japan ever since I moved. The first batch arrived from Hawaii three weeks after I landed. The second came from Australia six weeks in, and the third from San Francisco at eight weeks. The visitors have continued to come since then. With each group, I was able to do research on their needs and test out different products I was thinking about offering. They provided feedback and insight into what they found valuable/meaningful and what they didn’t. It was an amazing feedback cycle and a safe space in which to test concepts. These experiences helped me answer the questions: Am I solving a real need? How am I uniquely qualified to solve this need? These trials laid the groundwork for my business plan. I don’t remember one specific day when I thought, “This is it! This is my million dollar idea! I must do this!” But I do remember feeling confident enough about my research and concept, and I knew I would learn a lot more by doing than I would by planning, so I moved forward. From the offerings I had tested (itinerary planning, guiding, advice) I built a business plan. I took it to people I trusted (classmates from college, family, friends) and asked for their feedback. I built their feedback into the plan. And then over the New Year holiday, as I sat with my brother and sister around the kitchen table, I bought a URL and signed up for Squarespace to build my site. That made it real. It also meant it was time to approach lawyers and talk about incorporation. I see the six months between arriving in Japan and actually establishing a company as an investment in myself. One that will hopefully enable me to have a meaningful day-to-day impact on others and grow as an individual. I won’t know the returns of this investment for quite some time. But even now, it feels worth it—if only because I gave myself permission to do it. Company: Chalupa imports high-quality, craft goods from Mexico to Japan. Mariel originally came to Japan from Mexico for an internship at an architecture firm. She knew she wasn’t ready to leave when the internship ended, so she enrolled in a two-year language program. About three-quarters of the way through the program she decided to start an import business, Chalupa, which brings Mexican craft goods to Japan. Mariel had attended many fashion and design events and felt like the Mexican aesthetic was misrepresented. In her words, “it was all tequila and mariachi” and was completely missing Mexico’s design and craft renaissance. Mariel secured two partners in Mexico and together they founded the company. They incorporated in Mexico and set up a subsidiary in Japan. They wanted to have both an online and in-store presence. Building the online store was their biggest initial outlay at 1,300,000 JPY (13,000 USD). Chalupa just ran a successful crowdfunding campaign to help offset those costs and raised over 870,000 JPY (8,700 USD). They have also established partnerships with Archivando and T-site Art Corner to sell their products! Mariel is happy with what they’ve built so far and will continue to explore ways she can contribute to the design scene in Japan. When she isn’t running Chalupa she also does interior design work for stores and brands in Tokyo you can see her portfolio here. I originally planned to set up the business on my own, but I needed more help than I realized. I asked a friend to be my “partner” during the setup phase. She had to invest one yen and come along with me to meetings. After I got my visa, we removed her. I wouldn’t be here today if it wasn’t for her. Even if you don’t need someone on paper, I would highly recommend you find a Japanese friend/mentor you can consult with as you establish yourself. My Japanese business partner was instrumental in helping me adapt to the Japanese way of working. She explained situations to me, what was said and unsaid. She told me how I could be more successful in my communication style (giving pause, slowing down) and she contributed to my credibility in business situations. Business card etiquette: hand over in a slight arc, make sure your text is readable to the person across from you. Deciding who to work with was not a decision I took lightly. I was asking a REALLY big favor of friends that I had only known for five months, tops. I ended up asking my friend Kyoko, whom I had been introduced to by my brother’s girlfriend. They had worked together on the Marshall Islands after college. Kyoko had work experience in both Japan and Canada, which meant that she intuitively understood the business/bank practices here and could give me context on the cultural gaps that I was missing because I’d only had “western” business experience. She also had amazing attention to detail and was able to explain things simply to me so I understood. Before I met with Kyoko, I put together my business plan, financial projections, and a summary from the lawyer of her expected involvement. I also included a timeline with milestones and an estimation of when we could remove her from the company. Once removed, her liability would also end. Over dinner I shared this information and asked that she think it over and get back to me when she was ready. I communicated that our friendship was much more important to me than the company. I was happy to approach other people if she chose not to work with me. I am lucky she agreed. I wouldn’t be writing this article today without the help of my business partner. It turned out to be a much larger favor to ask than I had realized. When Kyoko and I were approaching banks she had to take half days from work. She also had to call the banks ahead of time to make sure we had the proper paperwork and schedule appointments if possible. After our meetings she would read through the Japanese paperwork to make sure it matched the English version. She wrote countless kanjis for me when we were filling out paperwork and translated during meetings/interviews. It was a part-time job for her that lasted for about six months while we set up the company, applied for my visa, got the corporate bank account, and removed her from the company structure. I am so, so grateful for her support, professionalism, and confidence in the business. I told her she could make a business out of helping foreigners start businesses, but I think she’s had her fill of the process… We’ll see. She enjoyed learning about the process—she’s always thought about starting her own company. Now that she knows exactly how to do so, she is more confident to try it one day. That is a secondary unforeseen benefit, and I am glad she got something out of it. Thankfully the process wasn’t a strain on our friendship—we only had a few pockets of condensed time commitments, and then after that I was able to keep the business running on my own and just keep her updated. For those coming to Japan without knowing anyone but with ambition, the first thing to do is make friends, both locals and foreigners. Seek out people with similar experiences so you can share learnings with one another. Invite people out for coffee or lunch—and remember to always pick up the bill. Immerse yourself. Personal connections will serve you best, especially in Japan, where introductions carry extra weight. CANVAS - online community for creatives in Tokyo. Pecha Kucha - monthly lecture series. Pause Draw - monthly sketching meetup. Tokyo Expat Network - online forum for foreigners. Hit the Road - running club. Ride the Lightning - design talks. UX Talks - design talks. Volunteer with Achilles - running group that "pairs able-bodied runners with athletes with disabilities." Volunteer with Tell - a group that provide mental health services. Japan International Business Network (Linkedin and Meetup) - group for people involved in business locally or internationally. Zen 2.0 - mindfulness conference. Instagram - Such an easy way to find people that have similar taste and interest to you. FEW - networking group for women. BusiNest - Incubator program for startups and small businesses. Hub Tokyo - co-working space. SPAN - design and technology conference. Continuing Josh’s story, Josh and his Japanese business partner, Eriko, met in America when Eriko came to the States to study for a semester in university. They stayed friends and reconnected when Josh moved to Japan. They had often spoken about starting a business together and decided to make it official after receiving enough interest in their product(s) to justify a business. Eriko was connected with an investor/incubator that offered services for companies getting started. The investor is an individual that works one-on-one with people, providing them with legal advice, office space, and capital required to get their business off the ground. Josh and Eriko’s investor made the process of starting a company super streamlined. The investor is busy and doesn’t spend time in the day-to-day operations of their companies, but they maintain a positive working relationship and make time to go to dinners together at least once or twice a year. For foreigners looking for investment in Japan, Josh would recommend getting your business card out there, finding events through Facebook or LinkedIn or alumni associations. Even just spending some time in a whiskey bar and sharing your business card with individuals you meet could lead to something. Josh also recommends speaking the language. When you have Japanese business partners nothing puts them more at ease than knowing that there is clear communication and mutual understanding. To find the right office place for you, begin with how you want to use it. Do you need meeting rooms for client presentations? Want to be surrounded by other entrepreneurs? Need storage for your products? Or just need a quiet place to work? Within the city, there are lots of different options at different price points; one is bound to match your criteria. I got an office space out of necessity for my visa but didn’t use it and saw it as a waste of money. There are other alternatives, so work with your immigration lawyer/realtor/friends to find the right one for you. My business is based around travel, and while I didn’t see a direct need for an office, my visa required that I have one with four walls and a lock on the door. It also had to be a separate address from my home address. Had I not had that requirement, I would absolutely be working out of one of the coworking spaces in Tokyo. They are casual environments filled with creative, ambitious people—amazing communities to be part of. Since I didn’t have a residency card, bank account, or permanent address, which is required to get my own lease for an office, I went through a serviced office provider, Regus. I framed my search for an office space by price point and location. I didn’t plan to spend much time at the office. But since all my mail was being sent there, I did want it to be easily accessible from where I lived. While I had heard in passing that people judged businesses by the address on their business card, I didn’t really understand what that meant. I had heard that Omotesando, Aoyama, Azabujuban, and others were great neighborhoods for business addresses, but I didn’t understand why. I didn’t think it would be very important for my clients who were from out of the country and unfamiliar with the different neighborhoods. What I had failed to understand was that I wasn’t trying to impress my clients, but business services like banks or partners like local tourism bureaus. Banks are weary of giving a corporate account to someone that doesn’t have a credit history in Japan, and I think it made it even easier for them to turn me down when they saw my address. Another note: You have to get a corporate account in the same neighborhood in which your business is registered. So, if you end up getting a less expensive space farther outside the city, you’ll have to open your account at the branch there. My rent ended up being higher than I wanted it to be per month. I only looked at properties in my range, but when we sat down to go over the contract I learned that I would also be charged a monthly fee for kitchen services (they provided free water/coffee, and it was non-negotiable—they made it available for everyone, so everyone had to pay.) And, if I wanted Wi-Fi or phone service I would also have to pay for that. Every print/scan/fax is also billed (that’s common practice at coworking spaces too). I felt misled, but I also didn’t know the system yet. So if you are working with someone, make sure to communicate your MAX budget, including rent and all additional fees, and see what options they can come up with for you. I used my credit card to pay the deposit and the first month’s rent. Then Regus had to verify my identity, so they sent a letter to the Airbnb where I was staying and I had to be home and sign for it. Once that was complete, the office was mine to use. Since this will be my second year of business, I have more information to share with the immigration officers. I can show my company financials, the fact that I’ve been paying taxes, that I’ve enrolled in health insurance, etc. There is a chance I may not have to have a separate office with four walls and a lock and still get my visa (fingers crossed). Tokyo Cheapo Guide to Serviced Office Spaces (from 2015). The Works - coworking space. The Hub - coworking space. If you do end up having to get an office, but you don’t plan on using it, there is actually a service where you can use your space to store traveler’s luggage, Temp Grab! Continuing Mariel’s story. Mariel is currently working out of an office space that she found through her network. Her friend knew a guy with a big office in Shibuya but only one employee and many spare desks. Their main office was in Osaka and they were only using the Tokyo office as a showroom for fabrics. It was the perfect fit for her because it had space where she could keep the store’s inventory. She was able to persuade the owner to rent her a desk at a really reasonable price, 30,000 JPY a month. She had also considered working out of a coworking space, but since she needs storage space for the import goods, that wasn’t an option. The best part about working out of this office is that she can witness meetings and business interactions of the other company from her desk and learn about actual Japanese business manners. The worst part is that sometimes people smoke inside and it isn’t a creatively stimulating environment. In total, it took seven months from when I first messaged the lawyers, went through the visa process, and opened a corporate bank account. It would have been faster, probably closer to five months, if I had transitioned my certificate of eligibility into a working visa right after I got it at the end of April. However, I have no complaints about how long it took. During that time I was able to build a web presence, test offerings, and begin working with clients. I was always able to run the business; the only things I wasn’t able to do until I had my visa were open a corporate bank account, get a Japanese cell phone number, and enter into a lease. The initial costs were around 8,000 USD, not including living expenses. At the start of this article, I mentioned that I faced “unforeseen” challenges throughout the process. How arrogant of me to expect that as a first-timer and a foreigner in a new country I would already “know” the process—and to be surprised that the challenges that came up were unforeseen. Of course they were! I’d never started a company in Japan before! The biggest actual challenge in the whole process was managing myself and my expectations. At times I was impatient and pushy and created undue stress for myself and others. I didn’t feel efficient working within the system and was frustrated by the fact that it always took me three or more conversations with the same person to get something done. I wondered what I was doing wrong and how I could have prepared better and been more effective. No one was doing anything wrong and no one was being purposefully unhelpful, although I often felt that people didn’t want to take responsibility for things. In most cases it was just a matter of learning about the system and then following the steps laid out. It’s actually straightforward, but it just took time to learn. Starting a company has been insanely humbling. Moving forward I have a better understanding of my tendencies and will work to lead with patience, curiosity, and the willingness to ask for help. In 2017 I’m offering my traditional services like trips to the House of Light and the Kumano Kodo and working one-on-one with individuals and corporations coming to Japan while also experimenting with new ways that the values of the organization can come to life through local partnerships, writing, research, and artist engagement. Specifically, I'm looking to partner with Universities and NGO's to bring their service providers to remote regions throughout Japan. My pie-in-the-sky dream is being a part of a project like the Benesse Art Site in Naoshima, whose mission is to create a space where visitors can reimagine their lives for the better. But that’s a very, very long-term vision. Thank you so much for your time. I hope this has given you insight into the process and some tools to move forward. If you know someone with an interesting perspective on Japan that I should interview, please introduce. If you know a special place in Japan that should be visited, let me know. If you know a unique hands-on experience to try, send along the details. Or if you know someone offering a similar service anywhere in the world, please put us in touch. I’m hoping to create a better network of service providers in the year to come. P.S. Who can help me figure this out? Springboard - redefining your definition of success. The Geography of Thought - why East Asians and Westerners may see the world differently. Riding the Waves of Culture - the impact of different cultures on business norms. Essentialism - a system for prioritizing and focusing. Good to Great - classic, business management. 99u - Learning how to work alone - how to be productive, make systems, notice distractions, etc. David Brooks, The Moral Bucketlist - life philosophy. McKinsey, Can Tourism Fuel Japan's Economic Growth? - opportunities, forecast of what is to come. Terrie's Take - weekly newsletter about business in Japan. Ian Lynam, 20 Steps to Working in Japan - great getting started guide. 99u, What you should start, stop, keep doing? - really simple review philosophy. Disrupting Japan - interviews with entrepreneurs in Japan. Invisibilia - the episode on fear especially. Coto Language Academy - language school in Iidabashi, Tokyo. I-talki - site to find tutors and language exchange partners. Japanese Pod 101 - online learning tools. Fluent U - online learning tools. Upwork - for finding freelancers. Squarespace - for designing a website. IdeoU - for design thinking courses. Acumen - for socially conscious business courses.